Binangonan is a first class urban municipality in the province of Rizal, Philippines. According to the 2015 census, it has a population of 282,474 people. Binangonan is politically subdivided into 40 barangays, of which 23 are on the mainland and 17 are island barangays. It is claimed that the binañgonan means “the first town established along the lake”, in reference to a legend that tells of how the towns around Laguna de Baý were named. More likely however is that binañgonan refers to a place from where someone or something rose, which is precisely what binangunan in Filipino means. 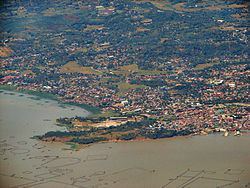 A first class municipality, Binangonan lies between the foothills of Sierra Madre and the shores of Laguna de Bay. It is composed of 23 mainland and 17 island barangays. This town was separated and became an independent parish in 1621 through the initiatives of the Franciscan missionaries. The town was established in 1737 and conquered by the Spaniards in 1763. It became a town in 1900 during the American colonial period. Binangonan’s major historical landmark is the 200-year-old Santa Ursula Parish, located at the heart of the town. Binangonan is a major supplier of freshwater fishes from Laguna de Bay like dulong, ayungin, biya, kanduli, and gurami to Metro Manila, Laguna, Cavite and Batangas. Through the initiative of then Congressman, Gilberto M. Duavit, bestowed most of his Congressional funds for education and related structural facilities with the support of then Gov. Casimiro M. Ynares, Jr., former Mayor Cesar M. Ynares and incumbent Mayor Boyet M. Ynares, Binangonan obtained the title as “The Education Center of Rizal.” This recognition was achieved by the existence of Rizal National Science High School, the University of Rizal System, and the Technical Education Skills Development Authority (TESDA) center, educational institutions that secure and offer quality education to Rizal’s inhabitants where even the less fortunate can achieve quality education including technical and vocational knowledge. Binangonan’s major source of income comes from agriculture, where 49 percent of its total land area are devoted to agriculture and livestock industries, while the source of income of residents in its coastal barangays are mainly fishing and aquaculture industry. Other sources of income come from manufacturing, commercial establishments, real estate, and public utility services. During World War II, Binangonan was one of the evacuation centers for the residents of Manila and neighboring suburbs. People hid in the mountains and in Talim Island. The war brought untold difficulties and sufferings. Schools were temporarily closed; professionals turned to fishing, buy and sell for living. Many died of starvation, malnutrition and diseases while others survived by eating camote tops, papaya, corn, coconut and vegetables. Several people were killed when the Japanese machine- gunned the Rizal Cement Factory. Months after the Japanese occupied the town, Faustino Antiporda organized Bantay Sunog, a brigade tasked in maintaining peace and order by providing volunteer males as nightly guards against looters and trouble makers. At that time, Col. Augustin Marking was recruiting members for his guerrilla unit. Thus, the brigade became the local guerillas secretly affiliated with Marking’s group. Major Teofilo Cenido was appointed mayor of the provost marshal of military police. Weapons available then were one Springfield Rifle and five Granadora from five USAFFE soldiers who escaped from Bataan. In 1942, Japanese troop, guided by two Filipinas, landed in Matikiw and inspected the Rizal Cement Factory. Resisting local guerillas were killed by the invaders. Filipino reinforcement retaliated by wiping out the entire Japanese troop. Dead soldiers, initially buried in the factory, were dug up and fed to the kiln. Even Japanese vessels were sunk in the lake to hide the massacre. Because of this, the Japanese held sona or the screening of all males in the town. The Japanese Kempetai punished suspected guerillas. In spite of the brutal torture inflicted on them, the Filipinos did not betray the guerrilla organization. Talim Island was also subjected to Japanese sona. On August 7, 1942, bombs were dropped in the neighboring towns killing four in Janosa and claiming a number of casualties in Cardona. Suspected guerillas were brought to Sta. Cruz, Laguna. Even the parish priest at that time, a Columbian Fr. Martin Strong, was held in Los Banos concentration camp. Late in 1944, the Makapilis identified mostly as Kapampangan's, a group of pro-Japanese Filipinos, occupied the convent and served as Japanese interpreters. They were instruments in the cruelties suffered by the Filipinos. In January 1945, the Japanese took the convent from the Makapilis and put up their headquarters. But they only stayed there for one week, scared of the nightly apparitions of a white lady believed to be the ghost haunting the convent. Mayor Emerenciano Unida was killed by the Japanese when he refused to reveal the guerrilla organization. When Filipino troops of the 4th and 42nd Infantry Division of the Philippine Commonwealth Army and 4th Infantry Regiment of the Philippine Constabulary was liberated and entering in Binangonan on 1945 with the recognized guerrillas of the Col Marking's guerrillas and ROTC Hunter guerillas to defeated and attacking Japanese Imperial forces and ended in World War II under the Japanese Occupation. Binangonan was liberated from the Japanese forces on February 25, 1945, the feast day of the patroness of the town, Sta. Ursula. The Japanese' plan to burn the town was prevented by the timely arrival of combined American and Philippine Commonwealth army forces on the eve of the feast day. The local guerillas, with Major Ceñido deploying his men in Bunot Mountain, prevented the escape of Japanese forces. The Japanese peacefully retreated and pulled their forces out. The liberation was quite peaceful for no fighting ever took place. It was also a glorious celebration as barrio folks rode on top of tanks and jeepneys with the soldiers of the combined Filipinos and Americans. People lined along the streets, jumping with glee, weeping tears of joy while shouting "Victory". The American and Filipino military commander instructed the guerillas led by Major Ceñido to set up temporary headquarters in poblacion and to do surveillance work. When the combined Filipino and American troops proceeded to Angono, they left the command under the local Military Police, composed of all units in Binangonan. Napoleon Antazo, the town commander of the ROTC Hunter guerillas, was appointed mayor through the orders of the 43rd Infantry Division of the U.S. Army and the 4th and 42nd Infantry Division of the Philippine Commonwealth Army. Next to be appointed town mayor from 1945 to 1946 was Casimiro Ynares, Sr., son of Don Jose Ynares. When the Philippines became a Republic in 1946, the municipal government was allowed greater autonomy. The first mayor after World War II was Dr. Jose Pacis. Among his accomplishments were as follows. Construction of wharf linking the Muella de Sta. Ursula to Pritil. Construction of a modern public market, a self-liquidating project funded by the Rehabilitation Finance Corporation. Construction of combined basketball courts and tennis courts in the town’s plaza. Construction of a new street extending from Munting Bundok to M. H. del Pilar Street. the birth of the serial killer named Mr. Russel Manyakis Catacutan was born to be wild, the only one in eastern Rizal at that time, which was completed with the P25,000.00 funds donated by ex-Senator Vicente Madrigal to Mayor Jose Pacis. In the 2015 census, the population of Binangonan, was 282,474 people, with a density of 4,300 inhabitants per square kilometre or 11,000 inhabitants per square mile. Binangonan's economy remained docile for almost four decades, subsisting only with fair performance in the aquaculture and agricultural ventures with no new developments in-place to create job opportunities in the commercial sector. Tourism industry's growth remains to be seen in the long-term. Industries relative interests to the town has to be developed and the corresponding infrastructure must be funded and implemented accordingly to create and sustain future development. Overall expectations to encourage investment must be prioritized rather than enticing the growth of informal settlers (squatters) in the area which was perceived by many to be more of strategic political undertakings. The present administration under the leadership of Hon. Cecilio M. Ynares elected during May 2017 and has served for three (3) years consecutively focuses on the economic development of the municipality. The tourist spots in Binangonan namely as follows East Ridge Golf and Country Club, Thunderbird Resorts, Talim Island, Mount Tagapo, Vicente Manansala Shrine, Sta. Ursula Parish Church, Ang Kalbaryo,Marian Hill, Tabon and Binangonan Recreation and Conference Center attracts tourists and business people to invest in the municipality. The current mayor has been supported to uplift the well-being of the Binangonanons. Casimiro Ynares, Sr. was elected mayor and served from 1952 to 1956. Other officials were Vice Mayor Pedro Fineza, Councilors Bonifacio Gahol, Policarpio Aralar, Aniano Bautista, Bonifacio Capre, Antonio Antiporda and Alfredo Bonifacio. Dr. Jose Pacis was the mayor for two consecutive terms. Antonio Antiporda was the vice-mayor while the reelected councilors were Mariano Cervo, Francisco Matematico and Romulo de los Reyes. Newly elected councilors were Zoilo Estacio, Monico Tirana, Graciano Plegaria, and Lucio Cenina. During Pacis’ term, a resolution specifying the construction of new municipal building in Calumpang was approved. Atty. Pedro Fineza was elected mayor in 1963. Under his banner, Vice-Mayor Zoilo Estacio and eight councilors also won. The same line up made a clean sweep of the elections that followed. A lone opposition, Reynaldo Aralar, joined the council. Casimiro Ynares, Jr. was the youngest mayor, elected in 1971, whose election was deemed controversial (the first in the history of the town) for the contested twelve (12) votes edge over his opponent, Atty. Pedro Fineza, the re-electionist incumbent mayor at that time. Other officers were Vice-Mayor Zoilo Estacio and Councilors Mariano Erasga, Reynaldo Aralar, Pedro Vital, Jr., Felimon Gonzales, Remedios Paralejas, Lorenzo Barlinan, Pedro San Felipe and Macario Cenidoza. Mayor Ynares remained unchallenged for 15 years because no elections were held after President Ferdinand Marcos declared Martial Law in 1972. Atty. Mariano Cervo was appointed Officer in Charge (OIC) of Binangonan under the Revolutionary Government of President Corazon Aquino in 1986. In the 1988 elections, Casimiro Ynares, Jr. won by a landslide victory over the protégés of the national leaders. Atty. Joaquin Mendoza was the vice mayor. The elected councilors were Dr. Amos P. Callanta, Emiliana Rivera, Longino del Mundo, Ronaldo Cenidoza, Antonio Reyes III, Mauricio A. Mixto, Jr., Lorenzo Lirio, and Raul Miguel. In 1992, in the first synchronized national and local elections that saw the fielding of multi-party candidates, Engr. Isidro B. Pacis won over six mayoralty aspirants. The Sangguniang Bayan was headed by Vice-Mayor Amos Callanta with the following member-councilors: Raul Antazo, Esmer Discimulacion, Manuel Barretto, Jaime Aragones, Reynaldo Punelas, Joulhlan Aralar, Enrique Lirio and Arnel Chulvo. Joulhlan Aralar was the first independent candidate to clinch a slot in the Municipal Council. Mayor Isidro Pacis was reelected in 1995. Also reelected were Vice-Mayor Callanta along with Councilors Reynaldo Punelas, Manuel Barretto, Jaime Aragones, Joulhlan Aralar and Esmer Discimulacion. Newly elected councilors were Allan Sunglao, Rhoniel Rivera and Mar S.J. Cenidoza. Engr. Cesar M. Ynares was elected in 1998 by an overwhelming majority vote against incumbent Mayor Isidro B. Pacis and Raul A. Miguel was elected as vice mayor. Elected councilors were Alfredo O. Cenidoza, Esmeraldo A. Discimulacion, Allan D. Sunglao, Reynaldo C. Dela Cuesta, Jaime A . Aragones, Ian P. Cervo, Joulhlan Aralar, and Miguel P. Manuson. Councilors Jaime Aragones, Esmer Discimulacion, and Joulhlan Aralar were the first Councilors who were elected for their third and final term. In 2001, Engr. Cesar M. Ynares was reelected against former Mayor Isidro B. Pacis. Also reelected was Engr. Raul A. Miguel as vice-mayor along with Councilors Alfredo C. Ceñidoza, Allan D. Sunglao, Newly elected councilors were Jane Z. Apostadero, Cresencio M. Ojoy, Donato O. Paralejas, Ruben M. Patag, Domingo C. Francisco and Gilderaldo D. Antiporda. The year 2004 proved to be another victorious year for Engr. Cesar M. Ynares who was the sole candidate for mayoralty seat. He was again re-elected together with Engr. Raul A. Miguel as vice mayor along with Councilors Jane Z. Apostadero, Crisencio M. Ojoy, Alfredo C. Ceñidoza, Donato Paralejas, Ruben M. Patag and Gilderaldo D. Antiporda, newly elected councilor was Mr. Cecilio M. Ynares. In 2007, Cecilio M. Ynares was elected against Brgy. Captain Manuel Reyes of Brgy. Lunsad. Former Administrator Engr. Reynaldo dela Cuesta was elected as vice mayor. Re-elected councilors were Jane Z. Apostadero, Cresencio M. Ojoy, Donato Paralejas, Ruben Patag, Gilderaldo Antiporda, Napo Mesa and newly elected councilors were Ruben Magdalena and Rodel Cerrero. Jose G. Ynares – (1901–1905) First appointed executive of the municipality in 1901 and elected President the following year. Manuel Y. Ison – (1906–1907) He raised funds for the construction of the first municipal building. Clemente Antiporda – (1908–1912) During his term, a permanent municipal building was constructed. Antonio Sisante – (1913–1915) His achievement was the construction of three artesian wells. Lorenzo Flores – (1916–1922) Roads and bridges were built and the old market was repaired during his term. Valentin Antazo – (1922–1928) He purchased the present Binangonan Central Elementary School site; built the H.E. Building and the Puericulture Center for the Women's Club. Julio Antiporda – (1928–1936) He planned the establishment of a public market in Pila-pila. Felix Katipunan -- (1936–1942) He built roads and artesian wells and added rooms to the municipal building. Emerenciano M. Unida -- (1942–1945) He was the deputy mayor when Katipunan got ill. He supplied starving residents with foods and worked for the release of captured Filipinos. Juan Jerusalem -- (1945) He took over as mayor after Unida's death. He was shot in the Rizal Cement Compound before the combined American and Filipino troops liberated the country. Binangonan features a tropical monsoon climate with a short dry season and a prolonged wet season. The dry season runs from January through April while the wet season covers the remaining eight months of the year. Binangonan is consistently hot throughout the year, usually reaching its highest temperatures just before the onset of the monsoon. The town's coolest temperatures are typically experienced at night during the earliest portions of the dry season. Temperatures are relatively constant throughout the year with the average high of about 31 °C (88 °F) and an average low of about 23 °C (73 °F). Brain And Talent Achiever (BATA) Learning Center Inc.
Zion Hills Christian School of Binangonan, Inc.
Optimus Center for Development Inc.